If you’re looking for an easy way to add mid-century style to a home—try accessorizing with vintage items that can be picked up at local flea markets and antiques stores. Not only are there many great items to be found, a lot of them are very affordable. These two pitcher and tumbler sets were discovered at the Brimfield Antique Fair in Massachusetts. 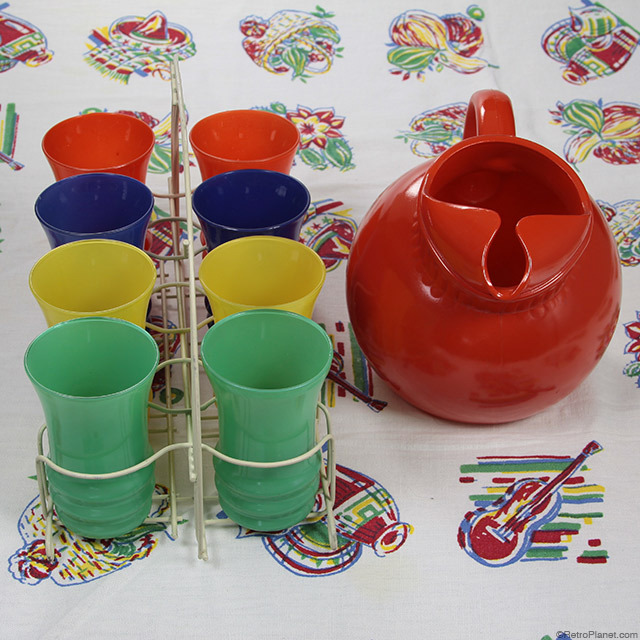 The glassware is colorful and the racks are nice examples of ‘50s art deco style that just ooze mid-century cool. These are a ball pitcher and juice glass set made by Hazel-Atlas in the 1940s or 1950s. 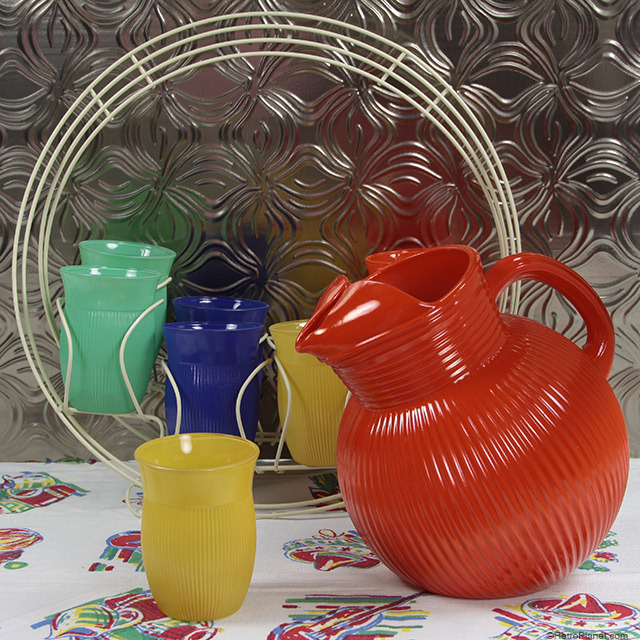 This tilt pitcher and the tumblers are part of the Fire King Rainbow collection. We believe these two sets were made by two different, very successful American pressed glass makers—Anchor Hocking and Hazel-Atlas. Anchor Hocking (founded in 1905) is still making glass products today and Hazel Atlas (founded in 1902) was in business into the early 1960s. Colorful collectibles like these pressed glass items by Anchor Hocking are desirable among collectors and add a great pop of color in a home. The smooth pitcher and matching tumblers set were made by Anchor Hocking. The pitcher is called a Rainbow ball or tilt pitcher. 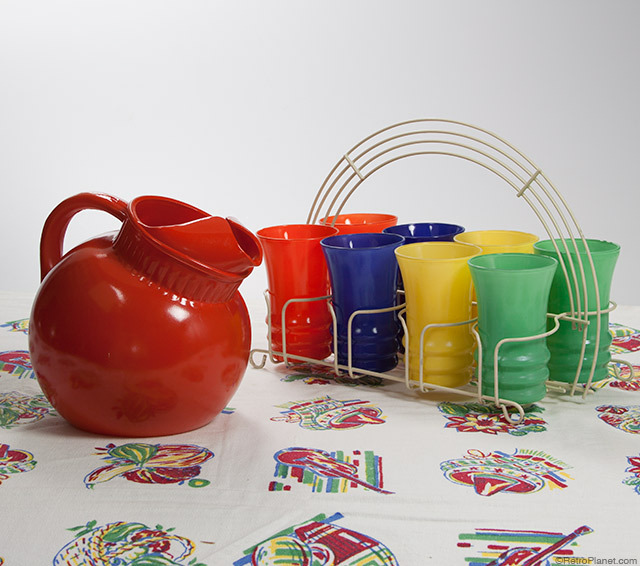 The Rainbow pattern was made by Anchor Hocking between 1939 and the early 1950s and was part of the Fire King line. Anchor Hocking began making the Fire-King line of nested mixing bowls, ovenware, dinnerware, serveware and refrigerator storage containers in order to compete with the dinnerware manufacturer Homer Laughlin and their very successful dinnerware line called Fiesta. 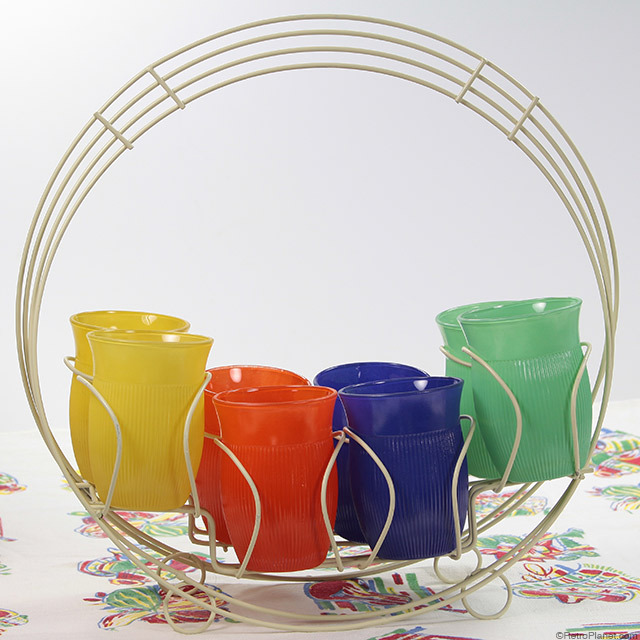 An art deco style wire rack from the 1950s is a great way to display colorful juice glasses made by Hazel-Atlas. Another manufacturer of glass pitchers and juice glasses in a style similar to that of Anchor Hocking was the Hazel-Atlas Glass Company. The rib design pitcher and glasses appear to have been made by them. As well as being collected and displayed, glassware like this is durable enough that you can still put it to use. Today mid-century Anchor Hocking and Hazel-Atlas are both very collectible. Pressed glass by these two manufacturers is a great category to get started with since Anchor Hocking and Hazel-Atlas produced massive quantities of their glassware products, so there are a lot of pieces still out there to be found and collected. Display in racks like the mid-century white wire glass carriers we’ve found here, or pick up old an old milk bottle carrier—it’ll do the job and look great, too!